Before committing to the purchase of an item of fine jewellery, it is important be aware of what to look for and understand gemstone and precious metal grading systems, to know what questions to ask. This section of the site is concerned with giving our visitors the knowledge necessary to make an informed decision. Please use the links above and browse through the following pages, acquainting yourself with all the gems and metals that our craftsmen utilize in the design and creation of our range of fine jewellery. Diamonds are said to be graded according to a set of factors known as the 4 C's. However, this is not really the full story as the 4 C's are a marketing term created due to the perceived need to provide quick and simple explanations to the diamond buying public. This has led to a confusion among the public which we hope to put right in as direct a way as possible. The most problematic of the 4 C's is the term "Cut" which, when applied to gemstones has come to encompass a variety of different meanings. These include the actual shape of a diamond, its proportions, its reflective and refractive qualities and the dimensions which affect its symmetry. 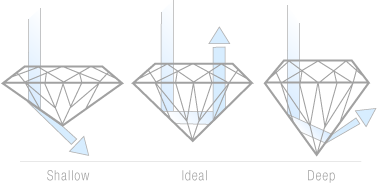 Diamonds are "cleaved" and then "polished" they are not cut. The cut of a diamond is an industry term used to describe the shape of a diamond, not its finished qualities. "Make" is the term we use to describe the quality of the polishing and includes factors such as the proportions, the symmetry and the precision of the faceting. The proportions of a diamond determine the amount of liveliness or fiery sparkle within it. When a rough diamond is polished, the polisher attempts to reveal its three hidden qualities. These are reflection, refraction and scintillation (life and fire). As reflection and refraction are mutually opposites the polisher must compromise these two qualities and attempt to maximize scintillation. A diamond that is badly made will not reflect light properly and its fire will be greatly reduced. In our considered opinion, the quality of polish, is the most important factor in determining a truly beautiful diamond. A diamond that is described as having a "deep cut" will result in an irregular sparkle, whereas a diamond said to have a "shallow cut" will appear lifeless as the light will pass through it, rather than being reflected back through the top of the stone. A polished diamond with proportions conforming to an internationally accepted range of measurements, described as "good to ideal cut", will radiate with sparkle. Rough diamonds have been and continue to be polished into literally dozens of shapes. Some shapes, such as heart shaped (or to use its technicaly correct name "Heart-Shaped Modified Brilliant") are only slight variations from the most recognisable, the round brilliant cut while others (like marquise diamonds) are more extreme departures. We use the traditional brilliant cut (round) diamonds and of course, heart shape diamonds in the manufacture of items within our exclusive range of fine jewellery. Each stone is calibrated in order to show its full brilliance and to perfectly complement our beautiful and timeless designs. The colour of a diamond significantly affects its price, the less colour a diamond shows, the better. Although some diamonds are colourless making them rare and highly valuable, almost all show colour ranging through various shades of yellow or brown. The scale used to grade diamond colour starts at D for colourless diamonds and runs through the alphabet to Z for diamonds that show a strong colour, are more common and therefore less expensive. Although only diamonds with a colour of D to F are technically considered colourless (and thus command premium prices), for all practical purposes, diamonds up to colour I will tend to appear colourless to all but a trained gemologist working under ideal lighting conditions. The more common and therefore less expensive diamonds graded from K upwards will show visible colour and from N upwards the colour is increasingly perceptible. Taking this information into consideration we advise that diamonds of G - I colour offer the best value, as we believe there is little reason to pay a premium for an undetectable colour difference and as such we do not use any diamonds that have a lower colour than I. Please note that the above scale is only used to grade standard diamonds not to be confused with "fancy diamonds", extremely rare and valuable gems that have intense colours such as pink or yellow. At present we do not use any fancy diamonds within our range. All diamonds contain impurities known as inclusions. These are made up of small bits of carbon and other minerals present when the diamond was formed. The clarity of a diamond is determined by the size, amount, colour and position within the diamond of these inclusions. A diamond that has no visible impurities when looked at through a 10x magnifying glass (or loupe) is classed as IF (internally flawless). This is the the highest grade of clarity for diamonds used in the jewellery industry, however you must expect to pay a very large premium for IF diamonds. The next grade down is VVS (very very slightly included) which is subdivided into VVS 1 or VVS 2. VVS diamonds have tiny inclusions which are difficult to detect, even under magnification. VVS diamonds also carry a large price premium. The term VS (which is also subdivided into VS 1 & VS 2) indicates a diamond which has very slight imperfections. To all except those with a trained eye, VS diamonds appear to be free of inclusions. In our opinion this grade of diamond (in conjunction with the other 3 C's) offers optimal value, which is why VS is the lowest grade we use for the smaller brilliant cut diamonds set in our diamond collection Claddagh rings. SI (again subdivided between SI 1 & SI 2) is the term used to describe diamonds which, when viewed under 10x magnification are seen to contain small inclusions. As there is an imperceptible difference in the appearance of these diamonds, only the sharpest eyed can spot these inclusions. We find this an ideal grade for the heart shaped diamonds that we use in our range of jewellery as they represent fantastic value for money. The lowest grades of diamonds used in jewellery are I1, I2 and I3 (or included but also known as Pique). Diamonds from these grades will have varying degrees of black spots clearly visible to the naked eye. We do not use any diamonds from these grades and we advise our customers away from them as the impurities they contain detract in no small way from their beauty and sparkle. Carat, the standard unit used in measuring the weight of diamonds and other gemstones, is the final factor influencing the desirability and value of a diamond. One carat (weighing 0.2 grams) is subdivided into "points", where 100 points is one carat. In pieces of jewellery with more than one stone, such as those in our diamond collection Claddagh Rings, the total carat weight is the combined weights of all the stones in the item. So a total carat weight of 75 points can also be expressed as 0.75 carat or 3/4 of a carat. Basically speaking, taking into consideration all the above factors, the bigger and heavier a diamond is the higher its value will be. However it is important to remember that a poorly cut large diamond of low colour or one that is heavily included will be less valuable and much less attractive than a well cut, clean and white diamond of a smaller size. In contrast to other beryl gemstones, emerald is typically heavily flawed with cracks and inclusions of fluid and minerals. These inclusions are called "jardin" (from the French for garden) as they typically resemble leaves and branches. These characteristics are not looked upon as negative aspects for emerald as they would be for other gemstones. Indeed, these inclusions are considered part of the character of the stone and are used to assure the purchaser that the stone is genuine. Because emeralds are so rare without inclusions, their presence does not overly detract from the value of the emerald. Most emeralds on the market today have been treated with various types of oil or resin to improve their strength and appearance. Emerald is a medium hard gemstone and is very heat sensitive. The typical inclusions can affect the durability, so emerald is easy to chip. 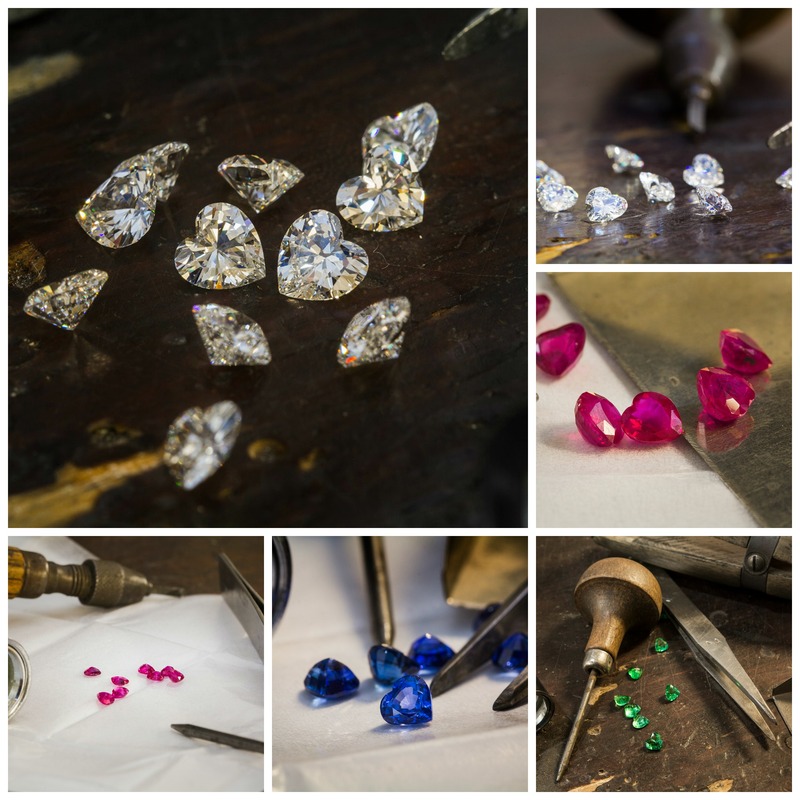 Lastly the oil treatment can be leached when the stone is cleaned, causing the gem's appearance to change. Extreme care must be taken when working with emerald set jewellery and the wearer needs to treat the gem with care. Emerald is one of the most difficult gemstones to cut because of the high value of the rough stone and the many inclusions found in crystals. Small changes in orientation can make a large difference in the final appearance of the gem. Skilled craftsmen who specialize in cutting emerald can be found in cities around the world for jewellers who insist on having stones perfected for the optimum brilliance and vibrancy. Emeralds are cut in Jaipur, India and Tel-Aviv, Israel as well as in the mining countries. Although sapphires can be found in almost any colour, blue is the colour normally associated with it. Cornflower blue is the standard that sapphires are measured against. A light and watery blue colour or dark, almost black sapphire is not at all desirable. The brilliance of a stone can be almost as important as its actual hue. Therefore the next most important factor affecting worth is clarity. A stone, which is relatively free of inclusions, will transmit more light, and therefore appear more brilliant. Clear transparent sapphires with no visible flaws are the most sought after. The colour of the sapphires that we select varies between bright blue through royal blue and all are expertly cut and calibrated to fit into the center of our Claddagh Diamond Rings. Gold is one of the most valuable metals in the world and is found in rivers, seas and the earth’s crust. A total of 120,000 tonnes of gold have been mined since the beginning of time, that’s about enough to fill one oil tanker. It will not rust, tarnish or corrode, in fact gold jewellery recovered from ancient Egyptian tombs was found to have remained in the same state as when it was placed there over 4000 years ago! Gold bonds easily with other base metals giving rise to the different colours available in modern gold alloys. Yellow gold is the original and most popular type of gold used in jewellery. Alloying gold with a mix of 50% silver and 50% copper produces yellow gold. White gold has become increasingly popular as a less expensive alternative to platinum. Alloying gold with a mix of silver, palladium, copper and zinc produces white gold. Rose gold (also referred to as pink gold) has been fashionable for centuries, its beautiful warm glow making it highly sought after to this day. Alloying gold with a mixture of 10% silver and 90% copper produces rose gold. Platinum is a very strong white metal discovered in Russia in the mid 1700’s. It is over 50% heavier than gold and its sturdiness makes it an ideal metal for making jewellery and in particular for the setting of gemstones. All our platinum jewellery is 95% pure and is alloyed with a related metal called iridium, in order to make it easier to work with. Silver is somewhat rare and relatively expensive, although not as expensive as gold. Fine silver has a brilliant white metallic lustre and is a very soft metal, so is alloyed with copper to make it more durable. King Henry II of England standardised the purity of silver in the 12th century. He imported refiners from an area of Germany known as the Easterling, thus silver with a minimum purity of 92.5% was referred to as Sterling Silver. Rolled gold is made by a process of heating brass under pressure with a thin sheet of high purity (usually 18kt or 22kt) gold in order to fuse them together. The resulting metal is then worked in the normal way. Rolled gold is robust and hard-wearing. 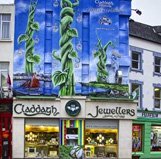 Unlike most other countries in the world, it is a requirement of law that every item of jewellery sold in Ireland, must bear a hallmark from the Assay Office in Dublin, Ireland. Hallmarks of assay offices struck throughout Great Britain, including London, Sheffield and Edinburgh are also accepted. 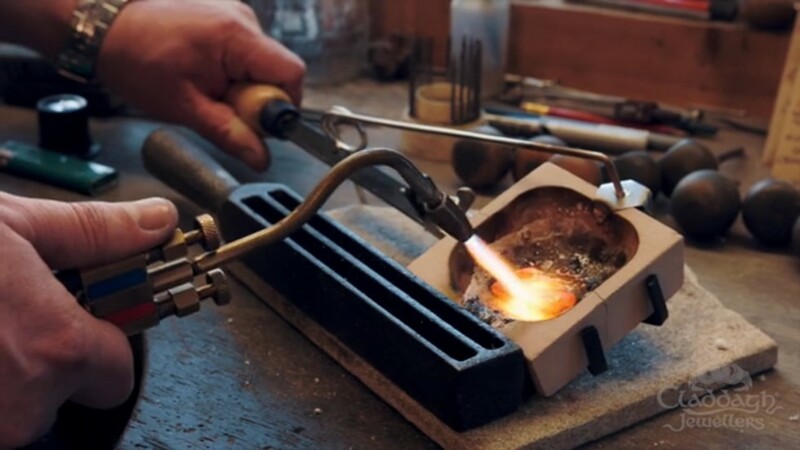 An Assay Office is essentially a metal testing laboratory regulated by the government where a small sample is taken from each item of jewellery and tested in order to determine the percentage of gold present. Once satisfied that the purity of gold is as claimed, the item is stamped with a hallmark. This provides our customers around the world a conclusive guarantee of authenticity. If an item fails to reach the purity that it was claimed to be it is crushed and then returned to the manufacturer. Makers Mark This is a two or three letter stamp that tells you who manufactured the item. Each item of jewellery that we manufacture is stamped with the letters LF imprinted for Love & Friendship, Loyalty & Fidelity. Assay Mark This mark identifies which Assay Office certified the item. 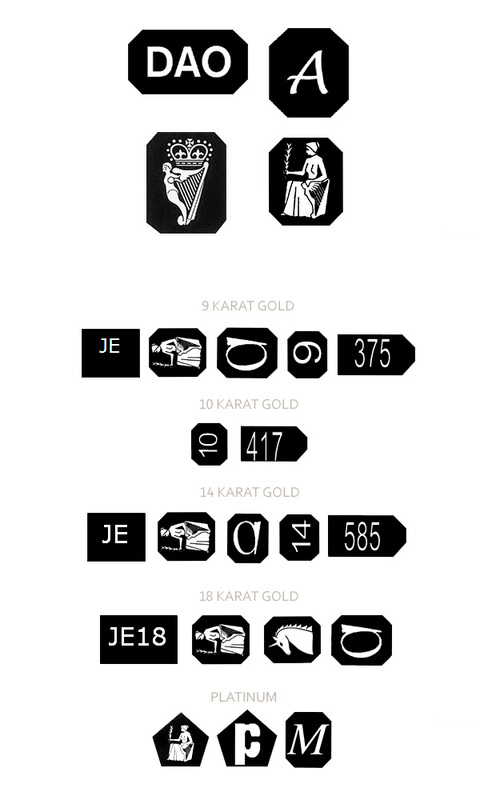 Purity Mark 1 Tells you how much pure gold there is within the item expressed as a number out of 1000. Purity Mark 2 Tells you what karat the item is. Date Mark This is a letter contained within a square or circle and tells you in what year the item was tested. All jewellery manufactured by Claddagh Jewellers and our selected suppliers will bear hallmarks of one of the recognized assay halls. For specific queries please email us. Karat (kt) is the standard measure of the fineness of gold on a scale, from 1 to 24, used to indicate how much of a piece of jewelry is gold content and how much alloy. 24kt gold or pure gold, also known as fine gold, is a very soft and malleable metal. In order to create a metal useful to a jeweler, other metals must be alloyed with the gold in order to make it hold its shape. A varying amount of stronger metals is used to produce 9kt, 10kt, 14kt, 15kt, 18kt, 20kt or 22kt gold. Diamonds were first mined in India over 4,000 years ago, though the modern mining industry began with discoveries in South Africa in the late 19th century. Today, the top seven diamond producing countries, accounting for almost 80 percent of the world's rough diamond supply are; Botswana, Russia, South Africa, Angola, Namibia, Australia and Zaire. When a diamond is mined it is known as 'rough' and needs to be cleaved and polished by the hand of an experienced diamond cutter into the familiar shapes that are used in jewellery worldwide, each and every polished diamond is therefore the intricate work of skilled masters. Diamonds are polished in many countries, but the major centers are located in New York, Antwerp, Tel Aviv and Bombay. Diamond is the hardest substance on earth, measuring 10 on the Moh's Scale. Only a diamond can scratch another diamond and smaller diamonds are used to cut facets on diamonds and on other gems. Centuries ago, it was believed that diamonds protected an individual from harm and actually brought luck and success to the wearer, counteracting the effects of unfortunate astrological events and endowing the wearer with charm and the ability to attract others. The Greek philosopher, Plato wrote about diamonds as living beings, embodying celestial spirits. Diamond has the highest polish of any other substance, and can reflect light better than any other element, which is why it is so highly prized for jewellery. Diamonds are composed of almost pure carbon, nature's most common and simple element. When subjected to heat and pressure, and over the course of millions of years, this carbon begins to crystallize and grow, forming a transparent gemstone. Diamonds as a commodity are among the most expensive items in the world, selling for over $11,000,000 per pound, although many pounds of diamonds are sold, in many different qualities and price ranges. Approximately 250 tons of ore must be mined and processed in order to produce a single one-carat polished, gem quality diamond, only one polished diamond in a thousand weighs more than a carat. Since nature never repeats herself, each diamond is unique. Diamond transfers and conveys heat more efficiently than any other element. Industrial grade diamonds are used in drill bits, abrasives and cutting wheels while apart from those used in jewellery manufacture, gem quality diamonds are also used aboard spacecraft as windows and camera lenses.